Served with Blue Cheese dressing and celery sticks. Hot or Mild. Do not be surprised by their smaller size, this makes them even more flavorful after smoking. Trust Us! These slightly salty and sour pickle chips are delicious when battered and fried. 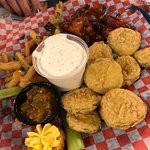 A platter of our favorites, hot wings, onion petals, deep fried deviled eggs and deep fried pickle chips. Enough to share! Topped with cheddar cheese, scallions and hickory smoked bacon. Served with sour cream. We take our slow smoked brisket and homemade brisket sauce and fill mushroom caps with it, sprinkle some cheese over it and bake them up extra delicious. Spicy Pepper Jack Cheese squares hand breaded and deep fried. Served on a bed of spicy Southwestern Chili. Thinly sliced sweet onion battered and fried to perfection. Served with Buttermilk Ranch. Yep, you read that right! 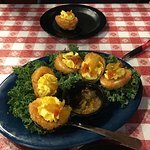 We make our own deviled eggs and then hand bread them and fry them. Served with Mama's Farmhouse Chow Chow. A huge plate of chips, covered with Spicy cheese sauce, our own slow-smoked BBQ pork, onions, black olives, and tomatoes. Served with a pile of Jalapenos, salsa and sour cream. Choose from 40 fresh items from our wide-open salad bar. All you can eat and then some! Salad Bar can not be shared. Slow cooked with ground beef, beans, tomatoes, and our special seasoning. Topped with shredded cheddar and scallions. Lunch Platters are served with all the fixin's, including bread and your choice of Two of these delicious sides: coleslaw, deep fried corn, french fries, green beans, potato salad, spicy macaroni and cheese, or bar-b-bar-que beans. Substitute a Baked Potato or a side of Onion Petals for one of these sides for a $1. Add a salad bar to Your Platter - $4.99 (Salad Bar must be eaten by person eating entree, no sharing). We slow smoke our pork for hours, then pull it. We slow smoke our beef and slice it. Tender, juicy and flavorful. Two delicious leg quarters of plump tender broiler; basted and slowly smoked. We take our slow smoked chicken, pull it and add our homemade sauce. These center-cut pork shanks come from the sweetest part of the pig, and are fall off the bone tender. 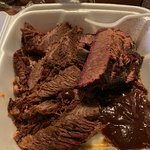 We take the top part of our brisket, smoke it, cut it up, sauce it, bake it and serve it up. This makes these highly delicious, but they do contain extra marbling, so not for folks who don't enjoy that. Subject to availability. Round up a gang of big Bar-B-Que favorites. 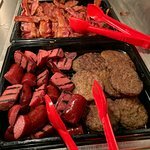 Choose any three of our delicious smoked meats - pulled pork, quarter BBQ chicken, baby back ribs, smoked sausage or beef brisket for a perfect and filling dinner. Wait until you try these meaty juicy baby backs. Definitely the house specialty. Hand breaded and deep fried until crispy. Smoked to perfection. It's the best sausage in the south. 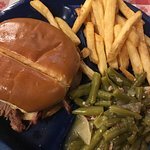 All sandwiches comes with your choice of Two of the following sides: French Fries, Bar-B-Que Beans, Green Beans, Coleslaw, Deep Fried Corn, Spicy Macaroni and Cheese or Potato Salad. Substitute a Baked Potato or a side of Onion Petals for one of these sides for $1. Add a salad bar to Your sandwich - $4.99 (Salad Bar must be eaten by person eating entree, no sharing). 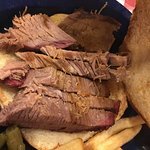 Choose from Pulled Pork, Sliced Beef Brisket, Smoked Sausage, Pulled Chicken or Burnt Ends. 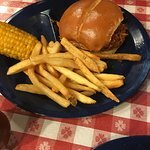 With grilled onions topped with our homemade sweet honey-BBQ sauce. Then served on Ciabatta roll with pickles. Pulled, slow smoked pork. The sandwich that made us famous. Chopped pork shoulder mixed with sauce & topped with coleslaw. Slow smoked sausage makes for a perfect sandwich. Hand breaded and deep fried until crispy and served with lettuce and tomato. 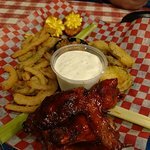 Tender, juicy and topped with our homemade Honey-Q-4-U BBQ Sauce. Mesquite grilled in our Honey-Q-4-U sauce and then topped with 3 strips of bacon and Monterey Jack cheese. Served with lettuce and tomato. Our smoked chicken pulled and mixed with our BBQ sauce. In order to make our burgers extra delicious, we use 2 patties in each burger, instead of one. For this to work, all of these will come Medium Well. Our burgers are grilled to perfection, giving it a flavor and juiciness that can't be beat. Served with lettuce, tomato, onion and pickle. Choose from American, Cheddar, Monterey Jack, or Pepper Jack Cheese. Our delicious burgers topped with our homemade pork chili, jalapenos and a slice of fried pepperjack cheese. Our delicious burger topped with American Cheese and thinly sliced, slow smoked brisket and our homemade brisket sauce. After over 27 years of slow smoking BBQ here in the Smokies, we think we have the best ribs around! 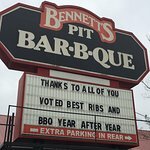 Voted Best BBQ & Best Ribs. 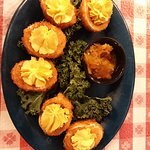 All below dinners served with bread and any 2 of: Bar-B-Que Beans, French Fries, Deep Fried Corn, Coleslaw, Green Beans, Spicy Macaroni and Cheese, Potato Salad, Onion Petals or Baked Potato. We slow smoke our babies for up to 6 hours at over 200 degrees to ensure that they are tender and delicious. 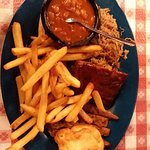 All below dinners served with bread and any 2 of: Bar-B-Que Beans, French Fries, Deep Fried Corn, Coleslaw, Green Beans, Spicy Macaroni and Cheese, Potato Salad, Onion Petals or Baked Potato. 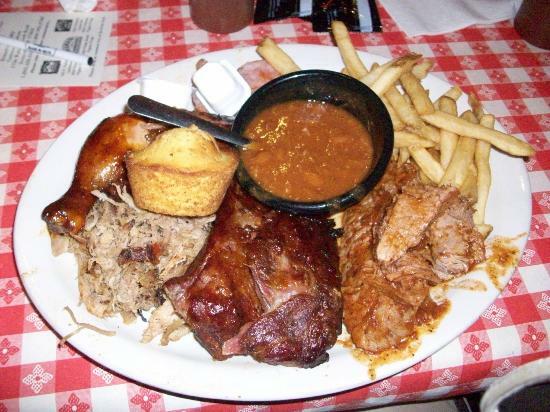 A generous portion of all five of our hickory smoked meats: Pulled Pork, Beef Brisket, Hot Leg, Chicken and delicious Baby-Back Ribs. A quarter of a Smoked Chicken and half rack of delicious Baby-Back Ribs make for a real two-fisted meal. Four Baby-Back-Ribs, Two Hog Legs and 1/4 pound of Pulled Pork. Get Ready! Try a generous helping of either our blackberry or peach cobbler. Served with a scoop of vanilla ice cream. Better than your Mama made. Topped with a scoop of vanilla ice cream. Rich and delicious, the way Chocolate Cake was intended. Served with a scoop of vanilla ice cream. Served with butter and sour cream, topped with Carolina Pork, cheddar and scallions. La nourriture était délicieuse, fraîche et rapide. Les serveurs étaient au top de tout. Le verre à thé n'a jamais passé la moitié du chemin. Juste comme je l'aime. Les côtes étaient remarquables, barq. C'était très bien aussi. Service excellent. La nourriture était fantastique. Les prix sont raisonnables. J'ai adoré la variété de sauces BBQ offertes. Été la visite incontournable depuis longtemps quand étaient visiter la région. J'ai mangé ici plusieurs fois à Pigeon Forge. La nourriture est très bonne mais beaucoup trop cher comme tout ici. 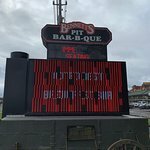 Obtenez des réponses rapides du personnel et personnes ayant visité le Bennett's Pit Bar-B-Que.